Popcorn Chicken Apple Kebobs made with Tyson® Any’tizers® Popcorn Chicken. These skewers have granny smith apples, fuji apples, onion, and bacon pieces. The Apple Butter Barbecue dipping sauce explodes these kebobs with the flavors of brown sugar and apples. I grabbed Tyson® Any’tizers® Popcorn Chicken while I was shopping at Walmart with the idea I was going to make something incredibly fun and tasty for my family. What I made was a huge hit in my home! It was so easy to make and even easier to eat!! I got everything that I needed to make these awesome skewers at Wal-Mart! Fall is my favorite time of year. It’s a time to slow down from the summer craze, settle into the comfort of home, and enjoy family. 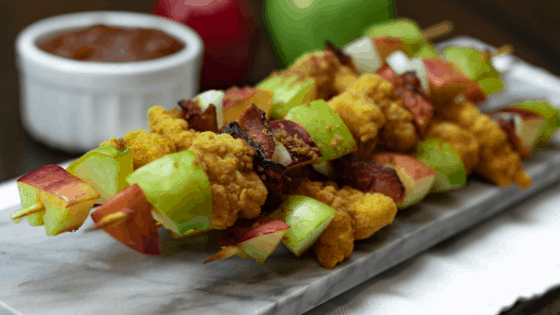 These Popcorn Chicken and Apple Kebobs bring the fun of summer and the traditional flavors of Fall inside for any family gathering. I spend as much time as I can with my family. During the Fall season it’s easier to do that because we’re not scrambling to fit in as many Summer activities as we can. It’s also a season that I like to make quick and simple foods for the family. I think my family can all agree that one of their favorite things about the fall season is that it’s Harvest time. Making these skewers with crisp apples and Tyson® Any’tizers® Popcorn Chicken was no-brainer to serve my family. The popcorn chicken is so easy to throw in the oven and the rest is so easy to put together while the popcorn chicken bakes. It’s a fun and tasty food to make for family game or movie night! Fall is such a beautiful time of year. The leaves are changing into gorgeous golden colors and temperatures are falling into more comfortable numbers. It’s also my favorite season so I like to enjoy it as much as I can. It’s also a time of busy after school schedules adding to the already busy days. Walmart Online Grocery Pickup saves a TON of time when you’re constantly on the go and don’t have time to shop in-store. It’s incredibly easy to use Walmart’s grocery service while in the carpool line to order your groceries. It’s easy to reserve a pickup time that suits your schedule and they even bring them out to your car! Cook bag of popcorn chicken according to package. Fry bacon according to package and sprinkle a little brown sugar on pieces while frying. Starting with Granny Smith and Fuji Apples, place on skewer. Place two small squares of bacon on skewer followed by two pieces of popcorn chicken. Repeat steps until skewers are full and you have reached your desired amount of kebobs. Place prepared kebobs on aluminum foil lined baking sheet. Sprinkle brown sugar over kebobs and place in broiler. Keep in broiler until brown sugar starts to melt and before apples or bacon burns. You know what im gonna try it today itself. It ia very tempting. I can’t wait to taste it.